Comic book fans have a history of getting into heated debates with each other but at this year’s San Diego Comic-Con we may get more than we bargained for. The Westboro Baptist Church is located in Topeka, Kansas and is lead by anti-homosexual propagandist Fred Phelps. The WBC preaches hate against homosexuals and believes that The United States of America is the enemy of God because of the nation’s acceptance of homosexuality. They also preach antisemitism and question the true body count of the Holocaust. The Church is also famous for holding protests at the funerals of American soldiers and homosexuals. We at Comic Impact approached the church for a comment in addition to their statement but they never returned out correspondence. The best advice for people attending Comic-Con is to just give these people their space. They have a first amendment right to protest so let them have their fun and don’t antagonize them. Ultimately, what they really want is a confrontation so the best way to fight them is to ignore them. The Westboro Baptist Church has a website where one can attain as much information about their organization as one would want, but the actual URL is in very bad taste and not appropriate for printing here. 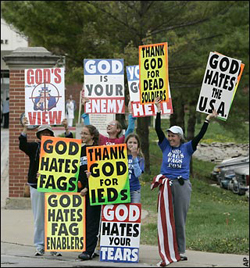 If you would like to look them up just Google Westboro Baptist Church.